Everything you need to grow your trees anywhere! 3 x multifunctional 45L green growing pods - plant and move anywhere! Now with a FREE sachet of beneficial Mycorrhizal fungi to aid root development. 3 treated softwood tree stakes, 1.2m long plus 3 super soft rubber tree ties, 30cm long. Protect your investment in fruit trees, with our high quality, easy to use and low-cost tree planting kit. 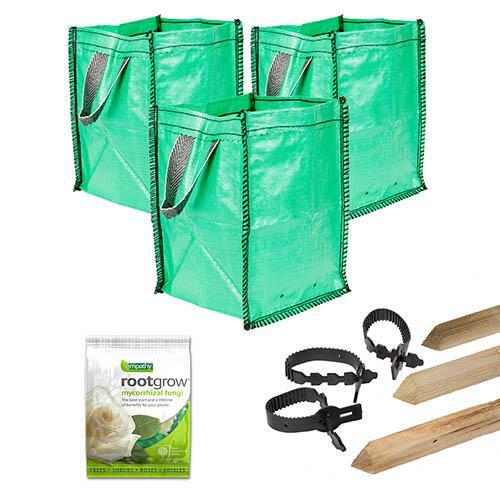 The perfect planting system for your patio trees, the 45L growing pod bags are the ideal solution for gardeners short on space, or those thinking of moving in the future when you can take your trees with you! The pods can be easily transported around the garden using the strong grip handles and are made from hard-wearing materials - they’re weather resistant and will last for years to come. Supplied as a set of 3 with 45L capacity. Also included are 3 treated and tanalised softwood support stakes, each 1.2m long, and 3 super-soft 30cm long rubber tree ties, to firmly hold the tree trunks in place while the root system establishes. In addition, we've included a 60g pack of Rootgrow Mycorrhizal Fungi, containing millions of beneficial fungi which will colonise the roots of your newly planted trees, giving better and quicker establishment, reducing losses and making trees more drought tolerant in dry summers. Each sachet can treat 3-4 trees. The perfect way to give your tree collection the best start possible!